This letter was inspired by a specimen I found in an old embroidery sampler book. I loved the look of the knotted ornaments that made up the thick strokes of each letter. Today's combination was fibers and photography. 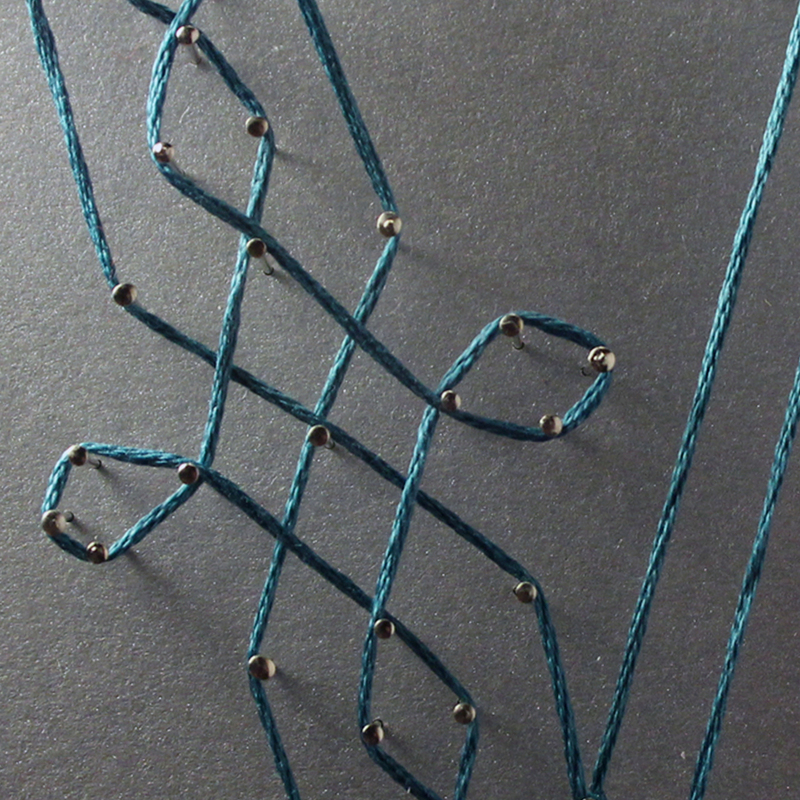 I decided to use embroidery floss to recreate the "knotted" letter with string stretched around pins, then see how the shadows affected the letterform through photography. 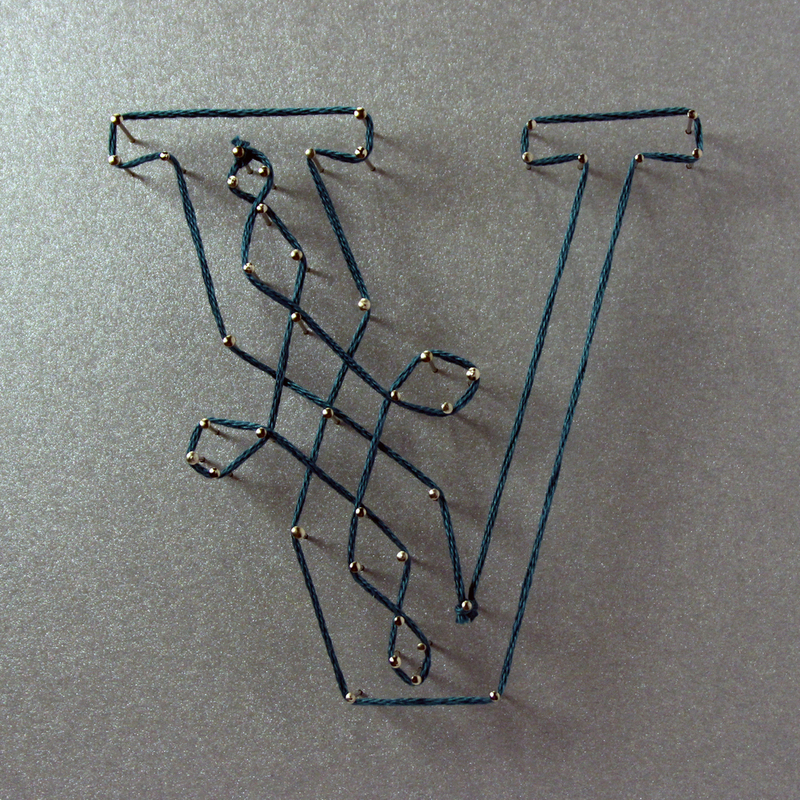 The materials are also a nod to the letter's origin in embroidery, though neither the pins or floss are being used in a traditional way. Since my first drawing of the letterform was freehand, it was a bit more fluid than the medium of pins and thread would allow. I'd need some kind of grid to be sure the letter was square, level, and evenly distributed so the wrapped string would clearly form my letter. 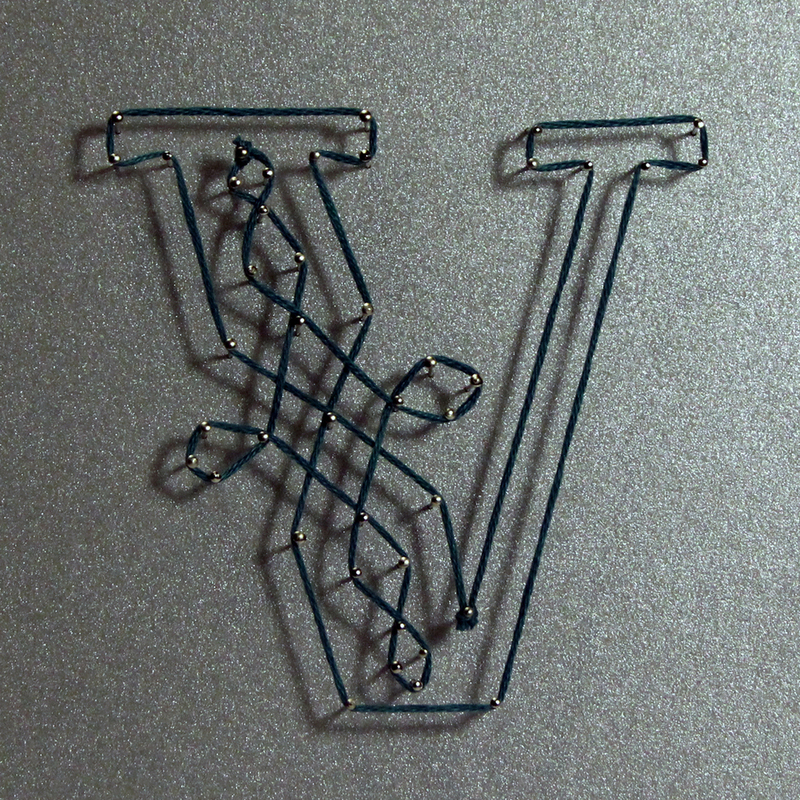 I did this by placing a digital grid onto my original drawing in Photoshop, and then plotting all the points where pins would need to define the letter's shape. In a lot of cases I had to correct mistakes I had made in my original drawing, which had really only been a sketch to explore how the intricate letter was made. Once I was happy with the placement of the dots on the grid, I printed out my template and laid it over my metallic silver paper, which I had glued to a stack of foam board squares. I lightly poked each red dot with a pin, without leaving the pins in the paper. Once I'd poked each hole, I could remove my template and place pins further into the foam board, using the holes I'd made. After all the pins were in place I wrapped my embroidery floss around the pins, during which I learned that this can't be done with just one string. 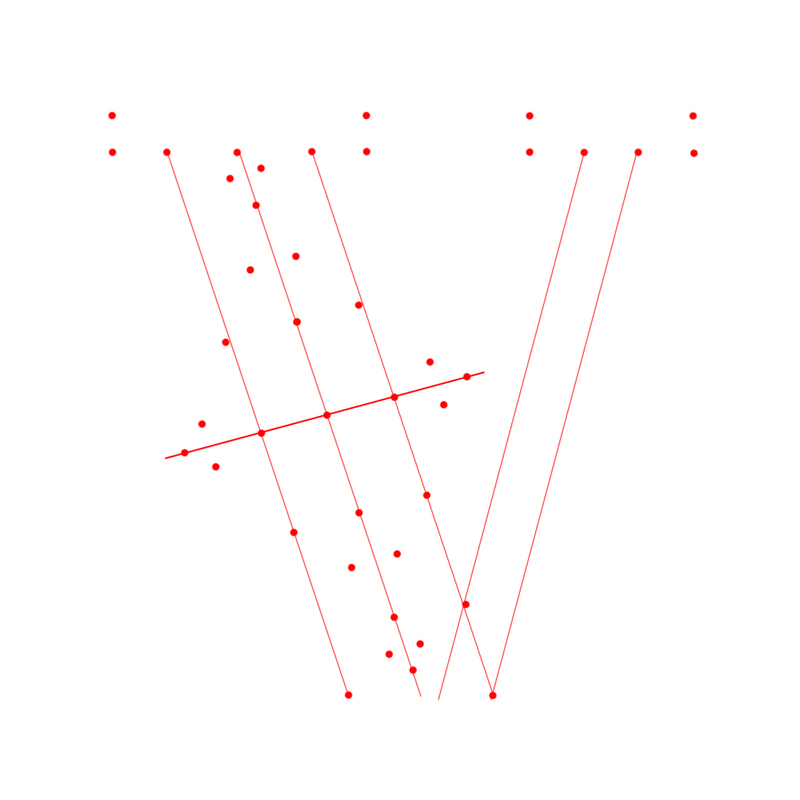 The knotted cross that stretches down the thick stroke is completely separate from the outer shape of the V, but since they do overlap at the center of the cross, it gives the illusion of one continuous line. The final form resembles my original drawing much more than I had expected it to, though of course the loopy nature of the cross' four posts are a little more pointed. The shadows created by shifting the light source really define the variations in the letter's appearance. Harsh, direct light produces a crisp drop shadow, giving the letter more depth. Soft, diffused light makes the letter float right off the page, and harsh, direct light makes all the lines of the letter instantly more bold. The key to this letter study was in translating rounded shapes into geometric for construction's sake, but doing so in such a way that the character and general tone of the letter is still carried through with these materials. Creating a scalable, repeatable grid to build out the rest of the letters would be necessary in creating a full typeface of this style.